A myHT Fortress: 30 Days of Thankfulness: Day 6 - Bing Crosby's "White Christmas"
30 Days of Thankfulness: Day 6 - Bing Crosby's "White Christmas"
Whether he is/was your favorite singer, or not, I would suggest that there is one voice that most people associate with the Christmas season: Bing Crosby. I absolutely love the classic films Holiday Inn, and its "reboot," White Christmas! With the musical genius of Irving Berlin, Bing crooned his way into Christmas memories as a permanent fixture. This album shares the name of the latter film, but has a wide variety of songs (most of which are not in the movie.) The title track is a secular, yet beautiful and sentimental song from the 1940's, as is "I'll Be Home for Christmas." And it's hard to beat Bing gently singing "Silent Night." Was Bing "multi-cultural" before it was cool? Some eclectic items are in the mix, such as the Hawaiian themed "Mele Kalikimaka" and the Irish sounds of "Christmas in Kilarney." 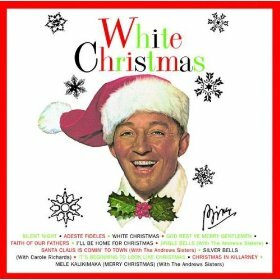 While Bing is no longer my absolute favorite (like he was when I was in high school), it still would not seem like Christmas was musically complete without him.